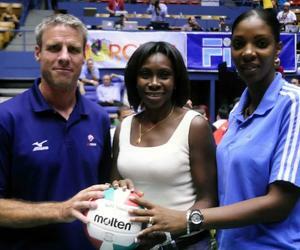 Cuban Mireya Luis was elected president of the North and Central Zonal Association (NCZA) of the North, Central America and the Caribbean Volleyball Confederation (NORCECA) this weekend at the annual meeting of the Executive Committee and Board of Directors in the Dominican Republic. According to NORCECA website, Luis, Olympic champion in Barcelona 92, Atlanta 96 and Sydney 2000, and current national methodologist of the Cuban Beach Volleyball Federation, replaces Mexican Saul Castro Verdugo, who resigned the position. NCZA includes the nations of Canada, United States, Mexico, Cuba, Dominican Republic and Puerto Rico. Lucille Hobson, from the US Virgin Islands, was elected as second executive vice president to replace American Douglas Beal. Costa Rican Edgar Alvarado was accepted as president of AFECAVOL and member of the Board of Administration without voting rights to replace Mrs. Marta Centeno who requested a one year leave of absence. NORCECA presidency also presented the appointment of Castro Verdugo and Puerto Rican Carlos Beltran, as honorary vice presidents. These proposals approved by the members of the Board of Directors are pending confirmation by the NORCECA Congress, scheduled to take place in Costa Rica from October 27 to 29.